As Cholera Season Bears Down On Haiti, Vaccination Program Stalls : Shots - Health News There's enough vaccine to treat the 100,000 Haitians who have signed up for it. But a government mix-up and a local radio station's incendiary report put the project on hold just a few weeks before the earthquake-ravaged nation's rainy season begins. 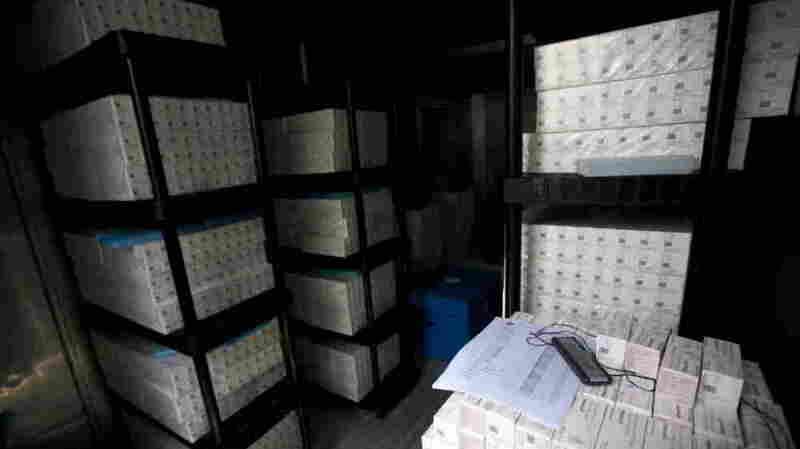 The vaccine — $417,000 worth of it — is stacked high in refrigerated containers to protect it from the Haitian heat. Hundreds of health workers are trained and ready to give the vaccine. They're armed with programmed smartphones and tablet computers to keep track of who has been vaccinated and who needs a second dose. And 100,000 eager Haitians, from the teeming slums of Port-au-Prince to tiny hamlets in Haiti's rice bowl, have signed up to get the vaccine. But everything is on hold. A long-planned project to find out whether vaccination is feasible in the midst of an ongoing cholera outbreak in Haiti has been stymied — temporarily, its proponents insist — by the kind of glitch that bedevils many projects in Haiti, large and small. Vaccination was supposed to begin this week in two carefully selected target populations. One is in a densely packed slum called Cite de Dieu along Port-au-Prince's waterfront, where raw sewage snakes its way from countless gutters into a garbage-clogged canal and into the sea. The other target area is in a rice-growing area bordering the Artibonite River about 50 miles north of the capital. This was the initial epicenter of Haiti's cholera outbreak in October 2010. But the campaign was abruptly halted when a Port-au-Prince radio station reported that the impending vaccination effort was actually a "medical experiment on the Haitian people" — a potentially incendiary charge. The Haitian Ministry of Health scrambled to counter that report, which apparently arose from a mix-up that occurred during last year's change of government. The previous government opposed cholera vaccination. It would distract from cholera treatment, officials said, and might spark dangerous resentments because there is only enough cholera vaccine in the world to protect 2 percent of the Haitian population. But the government of Haiti's new president, Michel Martelly, supports a cholera-vaccination demonstration project. His health ministry gave the go-ahead in December. The problem is, the two sponsoring medical groups — Partners in Health and GHESKIO — submitted their proposals last year to the previous government at a time when the World Health Organization hadn't yet certified the vaccine they were going to use. That government judged the vaccine to be "experimental" because it lacked WHO's imprimatur. So it referred the proposals to the National Ethics Committee. There they sat, apparently ignored, until the recent radio report woke everyone up. The committee has called for revised proposals, which were submitted Monday. It usually requires four weeks to review and decide, but proponents hope that can be accelerated. The rush is for meteorological reasons. Haiti's heaviest rains start in April. Those rains send the contaminated Artibonite over its banks and into villages in the low-lying river delta. The rainy season also floods the low-lying slums of Port-au-Prince, sometimes carrying sewage into people's crowded homes. Haiti's biggest spike of cholera cases and deaths occurred last May. Since Haiti's cholera outbreak began in October 2010, it has sickened more than 500,000 people and killed more than 7,000. Before then, there had never been a recorded cholera outbreak in Haiti. All evidence suggests the disease was introduced accidentally by United Nations peacekeeping forces from Nepal, a cholera-endemic country, when a latrine spilled sewage into a tributary of the Artibonite, 60 miles upstream from the rice-growing villages. President Bill Clinton, now the U.N.'s special envoy to Haiti, acknowledged that was the "proximate cause" of cholera in Haiti during a visit here last week. Villagers in the Artibonite delta are well aware of the cholera risk, and anxious to get the vaccine. Last Saturday, Alexi Rochnel pulled out blue vaccination cards for himself, his wife and his children. They live in a rice-growing village that pulls its drinking water from the Artibonite River. "Lately we have been facing this cholera disease that we didn't have before, so it's good to be vaccinated," Rochnel says. A year ago, during Haiti's rainy season, his wife fell ill with cholera. "It was very bad," he says, but she survived with hospital care. Jonathan Lascher of Partners in Health says the organization is confident the vaccination campaign will go ahead later this month. So are officials at GHESKIO in Port-au-Prince. If they succeed in showing that cholera vaccination is feasible, the next debate will be whether and how it can be scaled up to a much bigger proportion of the population in time for next year's rainy season.